I have seen most of the screenshots of this game and remember being very impressed by what I saw, but when the game loaded and we were looking down a bustling high street I was totally speechless. It was incredible, the screenshots do this game little justice, it has to be seen to be believed. The scale and complexity of Mafia is also incredible, it really feels like a bustling city full of traffic and people in a superbly detailed environment. The vehicles look very detailed and have realistic physics, you can see the cars roll as they turn sharply and brake. We were shown various parts of the city, and everyone of them looked spectacular. 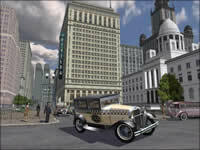 Racing games will be a fairly big part of Mafia's storyline, one level we were shown involved jumping into a 1930's sports car and driving round a track. 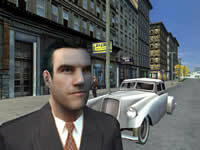 Although very different games Mafia and H&D2 do share some similarities, many of the basic character animations and vehicle physics will be ported straight into H&D2 from Mafia. Both games use the LS3D engine developed in house by Illusion Softworks by a dedicated team of four programmers (the original Insanity engine was created by one man), work on the engine is now completed and all we can say is stunning! they really have created something special with LS3D. Both games use the same technology to create the characters animations, all done in Illusions own motion capture studio, the scene on the river boat showed how good this is with people going about their business, some were sight seeing, others having a party on the top deck, some sun bathing, one man could even be seen being sick over the side. (Wonder who volunteered for that one). Its this attention to detail that gives Mafia and Hidden and Dangerous that unique atmosphere that other games just dont seem to be able to recreate. It's the sheer scale of the game that impresses so much, it runs incredibly smoothly considering how much is going on around you and will not require a super computer to run it. (a PIII, Geforce2 and 128mb RAM will give good results). We were both very impressed with what we saw of Mafia, the vast scale and trademark Illusion Softworks attention to detail will certainly appeal to H&D fans. The game is set to have many multiplayer modes including a racing game where you can shoot at opponents cars with Tommy guns, who wouldn't look forward to that! We hope to bring you more on Mafia after E3 in May.